As a continuation of our last blog, we’re going to focus on the Allied Order of Battle for our action around Maleme, Crete. The major opponent for the German Luftlande-Sturm-Regiment 1 at Maleme was the 5th Brigade of the 2nd New Zealand Division. The 5th Brigade had only arrived from the ill-fated expedition to Greece on April 25th, 1941 – less than a month before the German airborne invasion. This left little time to make good its losses in both men and arms. The 5th Brigade was one of two brigades that the New Zealanders used in Crete – the 4th was also present. The 6th Brigade was sent back to Egypt almost immediately as that country had been seriously denuded of defensive forces. An ad hoc brigade (the 10th) was formed through the attachment of the 20th Battalion (from 4th Brigade), the Divisional Cavalry Regiment and the creation of a composite battalion consisting of artillerymen without guns (4th & 5th Field regiments) and support & supply troops. 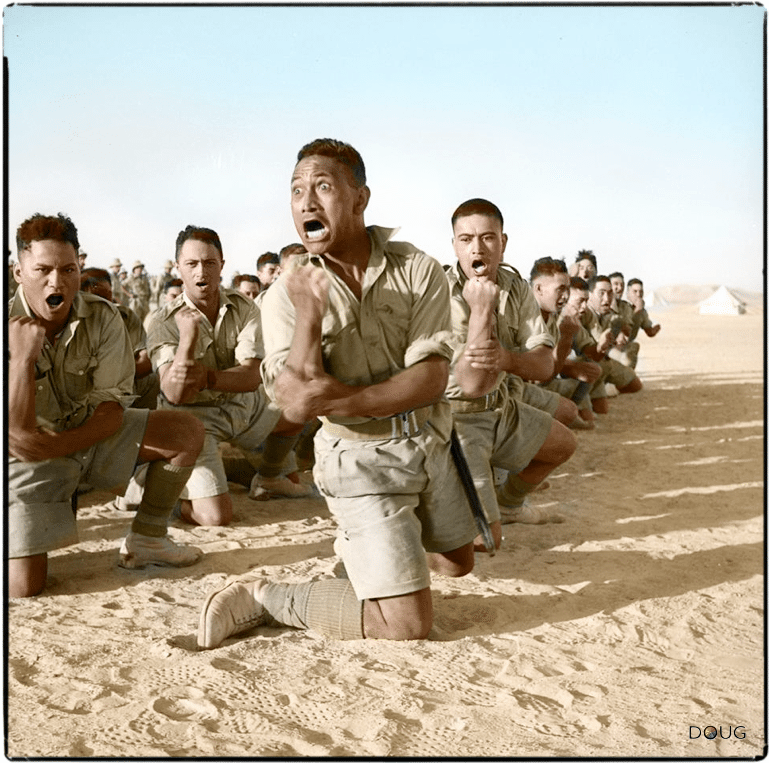 The 5th Brigade was composed of 4 infantry battalions; the 21st, 22nd, 23rd and 28th (Maori) battalion. All arrived from Greece in various states with the 21st understrength with only 376 men and the other battalions with between 570 & 650 men under arms. 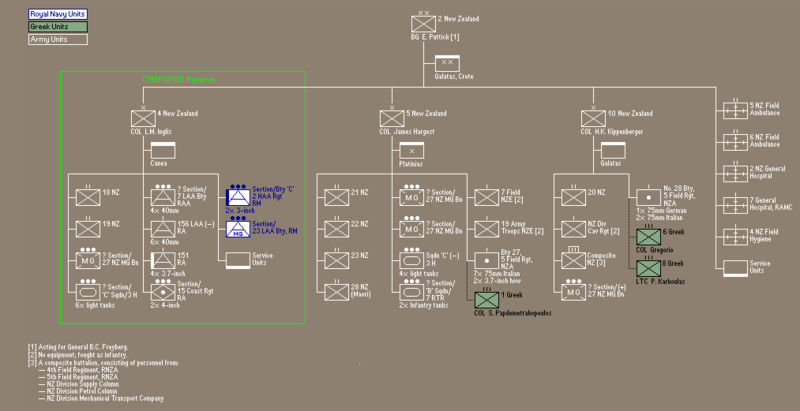 As the previous blog mentioned, we have to build these formations up from a platoon level. The New Zealanders were organised using the British establishment and equipment. The forces in Crete were built on the April 10th, 1940 amendment for infantry battalion layout. This formation had an authorised strength of 784 men per battalion. Unlike the German practice of four companies (three infantry and one heavy weapon) the British actually had four infantry companies and a headquarters/support company. The April 10th amendment had increased the infantry squad size from 8 men to 11, but this was still less than the 13 man squad the Fallschirmjaeger employed. Though weaker than the equivalent German infantry company, having four infantry companies per battalion allowed additional tasks to be completed. This was evident in Crete with how each defensive locale was built around a company. The headquarters company was more versatile than the German heavy weapons company with a number of elements such as engineers and recon (carrier) embedded in each battalion rather than being at the brigade/regimental level. These directly commanded assets increased the flexibility each battalion commander had. Niehorster’s order of battle lays out the additional attachments to each brigade. The 5th Brigade above reflects the motley assortment of units that were used in each defensive sector. 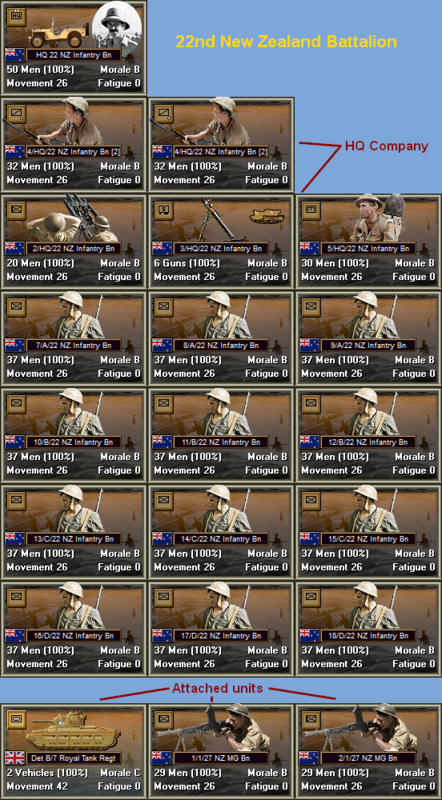 In the main, Niehorster has the bulk of 5th Brigade’s attachments correct with the exception of the four light tanks of the 3rd King’s Hussars. All ten of the Hussars available light tanks were held in reserve near Canea. The six Matilda tanks from 7th Royal Tank Regiment were allocated two each to the three airfields at Maleme, Retimo and Heraklion. They were destined to operate independent of each other. A mixture of Daniel Davin’s work ( http://nzetc.victoria.ac.nz/tm/scholarly/tei-WH2Cret.html ) and the official histories available for each New Zealand battalion confirms the state and mix of equipment for each unit. For example, the 5th Field Regiment RNZA actually had three Italian 75mm howitzers and four French 75mm guns, as well as the two British 3.7 inch howitzers. The French guns had improvised gun sites using chewing gum due to missing parts and are setup so that they can only fire at targets in direct line of sight. There were only a few carriers available for each of the four battalions and none of the recon platoons were mounted. These units are represented in the scenario as foot infantry. The body of troops that were in Crete but without specialist equipment are well represented by the New Zealand engineers (7th Field & 19th Army troops) which fought as foot infantry. In addition, the strong but poorly trained 1st Greek regiment was under 5th Brigade’s command, but was billeted to the west defending against possible invasion. It played little part around Maleme. There were a number of other formations that were part of 5th Brigades defences. A Field Punishment Centre was setup near to the 23rd Battalion and both the inmates and guards distinguished themselves when a German company parachuted around them. On Hill 107, both Royal Marine 3 inch AA and 4 inch naval guns (2 of each) were sited to cover the long shoreline. The naval gun commander was so convinced that a seaborne invasion was imminent that he refused to shell the advancing Germans! Two platoons from the 27th Machine gun battalion were also on the hill and it was the early destruction of one of these teams that allowed the Luftwaffe troops to gain a foothold on the airstrip. 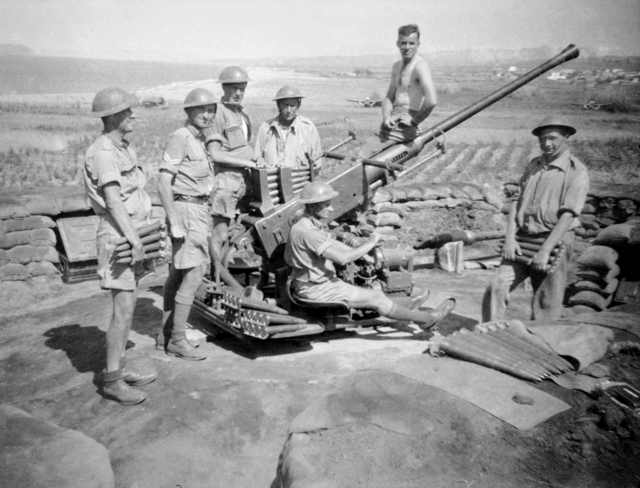 Australian gunners on May 18, 1941. Very few of these men were to be alive 2 days later. Around the airfield both Australian and British AA units crewed ten 40mm bofors guns. Royal Air Force ground crew manned both AA machine guns as well as provide approximately a platoon of infantry. The Fallschirmjaeger actually penetrated the airfield via the tented RAF camp as no one wanted to move the officer’s mess (!!) to improve the defences. The other battalions of the brigade were not to be involved around the airfield until the counterattack late on the 21st May by the 23rd and 28th (Maori) Battalions. The Maori’s in particular were very skilled fighters (particularly at night) and were to distinguish themselves during the campaign on Crete. Our next blog post will move onto map research and creation. Nice post. Great progress, and some lovely photos. Thanks! What’s the ETA for this title? This year? We are progressing well, but it won’t be this year. We have had to do a lot more work than normal, particularly in the areas of map making which has been a real time sink. That said, we’re really happy with the end result. I appreciate all the work. I am very eager for this title. To add to what Peter Winship said above, I think programmatically the thinking of the computer can see the stream as running along a hexside. The artist though could just smooth that out a little so that it is visually more appealing. To be honest this is not a deal breaker for me but perhaps this would make it easier but still good. Great detail – thanks for keeping us all informed. I like the direction PB is heading!